Decreasing the amount of water going over spillways at Little Goose Dam on the lower Snake River seems to be helping spring Chinook find the fish ladder and pass around the dam, the interagency Technical Management Team was told at its June 7 meeting. The problem the spill reduction addressed is eddies in the tailrace at Little Goose, which are the suspected cause of a passage delay. Cutting back spill to 30 percent of the flow and other operational changes have apparently reduced the energy and velocity of eddies below the dam that disorient spring Chinook and inhibit them from locating the fish ladder, according to Russ Kiefer, a biologist and Idaho TMT member. Fish managers noticed several weeks ago that adult spring Chinook that were counted as they passed Lower Monumental Dam were not passing Little Goose Dam, the next upstream hydropower project. For example, by June 3, an estimated 21,658 spring Chinook had passed Lower Monumental, while only 15,101 had been counted at Little Goose two days later. The low conversion rate between the two dams indicated a problem at Little Goose. The eddy formation in the tailrace at Little Goose varies with flow discharge volume, powerhouse operations and spill configuration. But diagnosing and solving the problem from one year to the next is difficult. Eddies and currents have caused passage problems at Little Goose before, in 2010, by the operation of a top-spill weir. This spring, high flow and spill volumes along with outages at unit powerhouses appear to be increasing eddy intensity below the dam and delaying adult passage over the dam. When dam operators--at the request of TMT fish manager representatives--switched from releasing 50 percent to 30 percent of the flow as spill and were able to operate all powerhouse units, the fish responded. The counts at Little Goose bumped up from about 400-700 spring Chinook a day to over a thousand during June 7-9. TMT members agreed to continue the 30-percent spill for another week with an additional two hours of 30-percent spill each day. Also for the next week, spill will be released evenly as uniform spill rather than bulk spill and all powerhouse units will be in operation if possible. The interagency team will evaluate the results after a week and decide whether it's appropriate to continue with the 30-percent treatment. Other variables are also factors in maintaining water flows at 30-percent spill for part of each day. These include keeping total dissolved gas (TDG) levels below 125 percent. They've been about 118 percent TDG, and no gas bubble trauma has been seen in downstream migrating juveniles. Debris must be cleaned from screens to protect the juvenile migrants, which can require powerhouse units to be taken offline. Trash cleaning has meant some units were not in operation this spring. Then there's the large volume of water coming down the river this year. 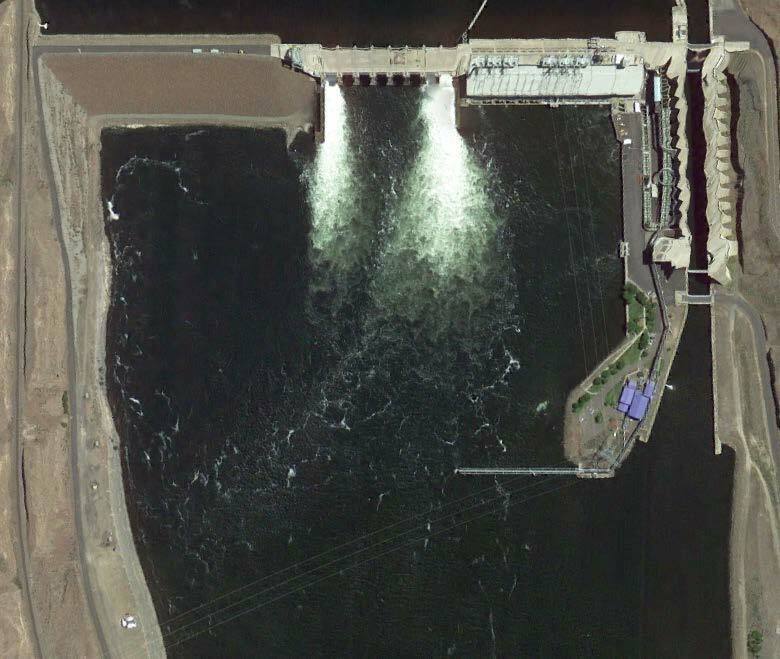 Significant involuntary spill has occurred throughout the Federal Columbia River Power System, including at Little Goose; the spill is mostly in excess of hydraulic capacity. More inflows could make it difficult to maintain only 30 percent of the flow as spill or to keep the reservoir at minimum operating pool. Fish managers want to keep the reservoir at minimum operating pool elevation to give downstream migrating juveniles the fast-flowing water that gets them to the ocean quickly.